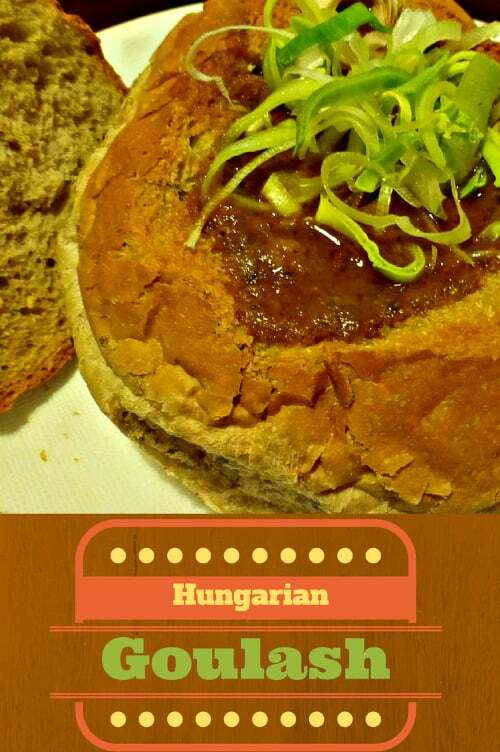 Goulash is a traditional Hungarian Soup featuring the favorite spice of the regional – paprika. When making this dish it is important to use the freshest Hungarian Style Sweet Paprika you can find. The soup was originally made with lard and thickened with lots of sour cream. Since most of us don’t work on a Hungarian farm, today’s versions are more often thinner and made with vegetable oil instead. Saute the finely chopped onion over medium heat in a heavy bottomed pot in the lard until translucent. Add more oil/lard if needed to prevent the onions from sticking. Remove the pan from heat, add the paprika powder and then the meat. Return the pan to the heat, season with salt, add the cumin powder, and caraway seeds and garlic. Saute over medium heat to bring out the aroma of the spices for approximately 3 minutes, taking care not to burn the paprika. Add the tomatoes and 5-6 cups of water or low-salt beef broth and bring to a boil. Simmer for about 40-50 minutes until the beef is tender. Add the carrots, potato and green pepper and continue simmering for approximately 30 minutes until the vegetables are tender. For a thicker soup, mix 1/2 cup of sour cream with 1 tablespoon of flour and 1/2 tsp of paprika. Mix until smooth. Combine with some of the liquid in the soup to temper the sour cream, and then add to the soup. Simmer for another 10 minutes. Serve with sliced hot fresh green peppers (as a garnish) with a side of sour cream. 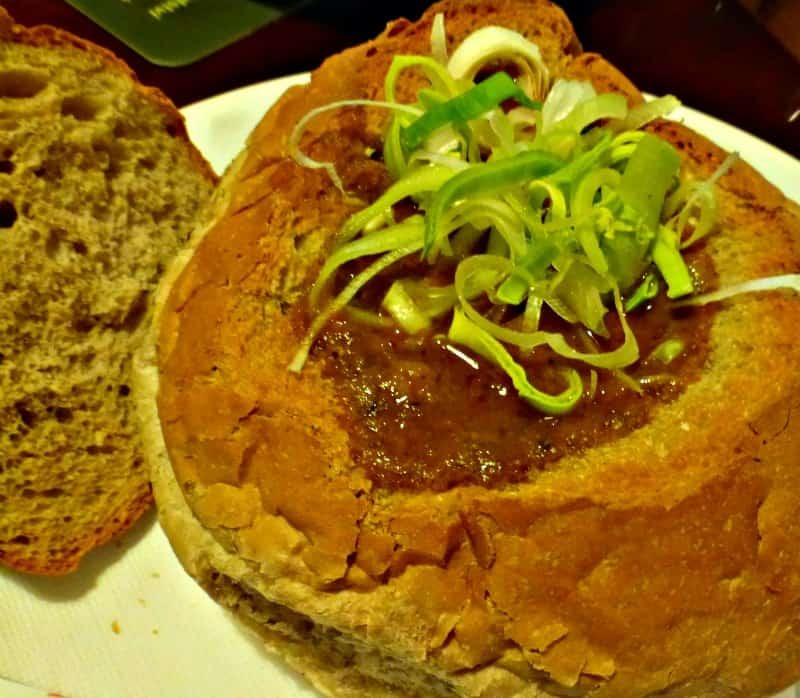 You can also serve in a bread bowl or with Hungarian Dumplings (Nokedli) on the side to add to the soup if desired. Thank you to our friends at Budapest Urban Adventures who took us on a fantastic Bites and Sights Tour of the city and introduced us to this soup. They also graciously provided us with a recipe that we adapted for this post.